Hello friends! I am currently writing this post from a place quite far away from my usual abode- 671 miles, to be exact. I have found myself in Michigan. The land of blueberries, lakes, and lighthouses is currently home to my family, at least for this week! You would be surprised how darling this place is. Everyone goes on and on about New York and Los Angeles, but honestly, some of the cutest places are small towns. Growing up as a small town girl, my heart fluttered as we entered Holland, MI. It has the most wonderful, charming vibe and the cutest shops! It reminded me of a lakeside version of my hometown. We also made our way over to Grand Haven, another lovely area on the coast of Lake Michigan. I absolutely fell in love with its classic red lighthouse. The New England Vibes the town gave off matched my outfit perfectly. 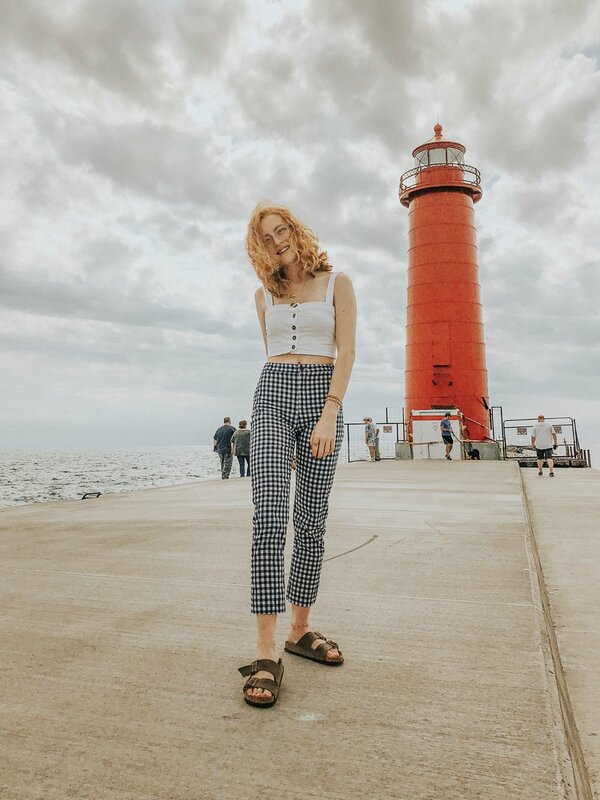 I styled my favorite gingham pants from Brandy Melville (similar) with an adorable top from Forever 21. I accessorized with some of my favorite necklaces, one of which I actually purchased while in Holland from an adorable shop called Karla's Place. I am currently obsessed with the classic and preppy look dominating the fashion world right now. This fit, complete with blue and white gingham and darling tortoise-shell buttons, satisfies my craving for this trend! Hopefully I'll get to style this outfit down in my southern hometown when I return home. Where have you been exploring this Summer? Tell me on Instagram!